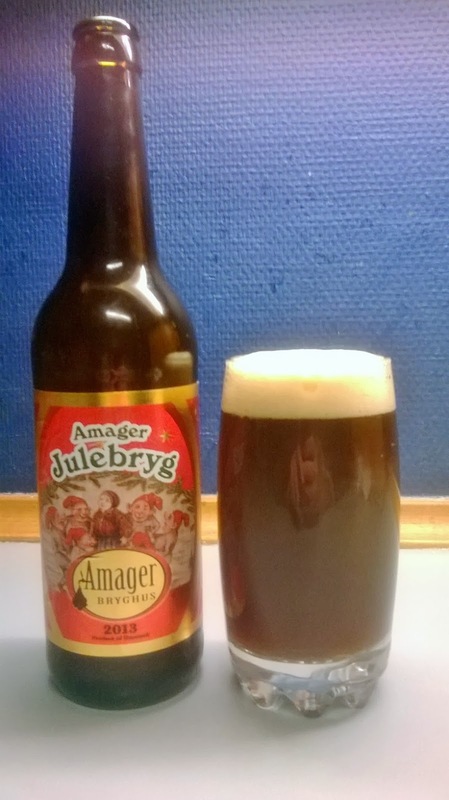 With the Danish named Hurricane Bodil approaching a winter warmer is in order so….Back to the festive beer again. Amager, once again changes style as the 2012 version I had last year was a very decent brown ale. This year they have brewed an abbey dubbel without any seasonal spices added. Light nutty aroma with roasted malt, dried fruit and caramel from the pour. This one pours hazy dark amber brown with a creamy off-white head. Semi sweet slightly roasted malty intake with figs, nuts, chocolate and caramel while the sweet finish is quite dry with a fruity and yeasty sourness. Mild chocolate short aftertaste with figs, raisins and roast, bordering on smoked malt again. Very softy carbonated, full bodied and the mouthfeel is smooth and creamy. No alcohol shines through. Well, this one certainly went up in status as it warmed up, 30 mins out of the fridge and it was so so when pouring while finishing up at room temperature it was extremely enjoyable, maybe because it's all toasty in here while the wind batters the windows, talk about a time and place for a beer. Yet another danish christmas beer without all the spices. It seems to be a trend from the opposite of last year when everything was heavily spiced with orange peel, coriander and star of anise. As you might gather, I enjoyed this one and have no problem buying/drinking another. Summing up, decent craft abbey brew. This scored 7.5/10 on the 'monks…do it better' Beerometer. Where to buy CPH : Kihoskh, Sønder Boulevard 53, Kbh V. Also seen in other bottle shops.